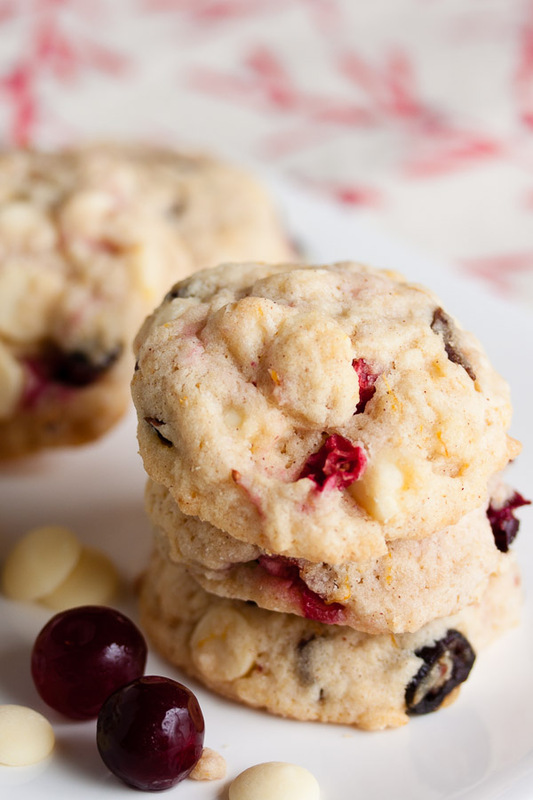 White Chocolate Cranberry Cookies | wanna come with? Flip through any cookie recipe book (or scroll through my past posts) and you’ll see a lot of browns and beiges. From golden chocolate chip cookies to the palest sugar cookies to chocolate cookies so dark they’re almost black. Very monochromatic, right? Well flipping through my books one day, I suddenly saw a dash of colour. A bit of pink in an otherwise pale cookie. Pretty! Cranberry? YES! I love cranberries. They’re a constant staple in my freezer – I use them in muffins, oatmeal and smoothies all the time and will often toss them in even if the original recipe didn’t call for them (because yum). 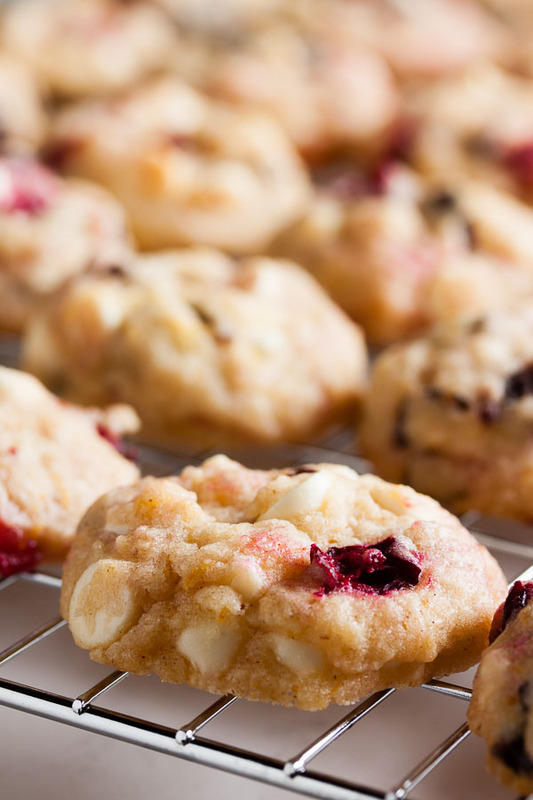 Tart cranberries paired with sweet white chocolate sounded really good, so I decided to give these cookies a try (and I hadn’t even seen the orange zest in the recipe yet!). These cookies don’t spread or puff up much and end up being pretty tiny – about 2″ diameter using my usual cookie scoop. I actually wondered if my baking powder was maybe dead, so I tested it – nope, bubbles up fine (if you’re wondering, you just add 1 teaspoon of baking powder to 1/2 cup of hot water – it should immediately bubble and fizz up a lot). 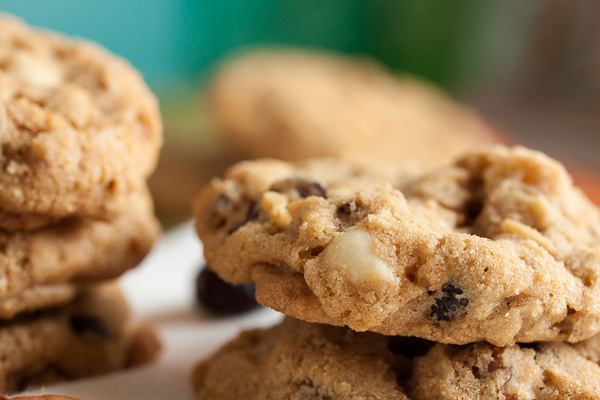 But the recipe states that even if you use a larger scoop or soupspoon as instructed, the cookies will only be 2-1/2″. I think the reason they’re so tiny is that there is so much stuff in here. The percentage of dough per scoop is so low that there just isn’t enough there to expand. A couple weeks ago, I made these triple chocolate chip cookies and was amazed at how high the ratio of inclusions to dough was. But in that recipe, there’s just over 6 cups of dough ingredients and 3-1/4 cups of inclusions. In this recipe, there’s only 3-1/2 cups of dough ingredients to 3-2/3 cups of inclusions. Wow. That’s more inclusions than cookie. Will I make these again? Oh man, yes. Absolutely yes. 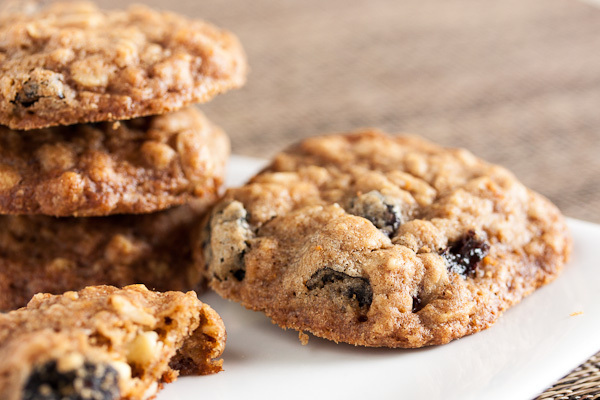 These cookies are dense and incredibly soft – almost cake-like. 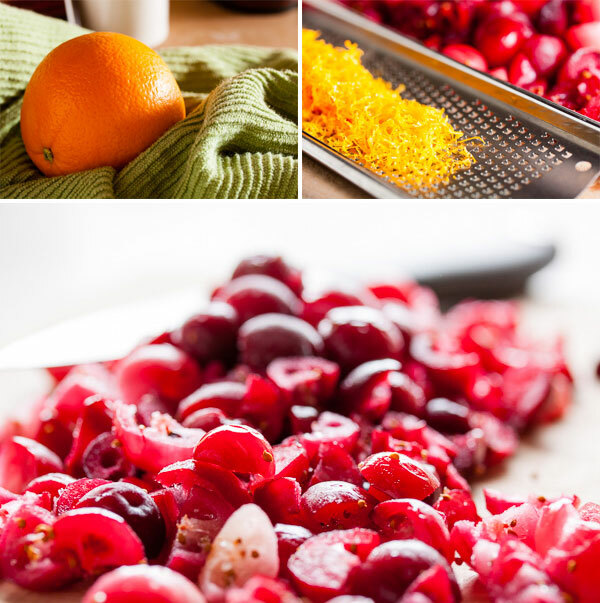 The orange zest merged with the dried and fresh cranberries is one of my absolute favourite flavour combinations, and the cinnamon and ginger are very subtle, but add a bit more depth. Whenever I make cookies with inclusions, the last one is always made up of the dregs scraped from the bowl and is usually just batter. And even with nothing else in there, this is a really flavourful cookie (yes, I ate that last one so no one else would have to – I’m so selfless). For that reason, I think I’ll try them again, but double up on the dough portion of the recipe. They’ll be fantastic. Note that the recipe below lists the original ingredient quantities. Feel free to double-up on the cookie portions of the ingredients if you want to. 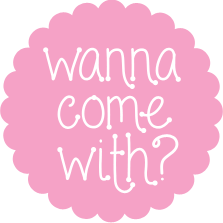 I suppose you could also halve the inclusions, but personally I’d aim for the “more cookies” route. 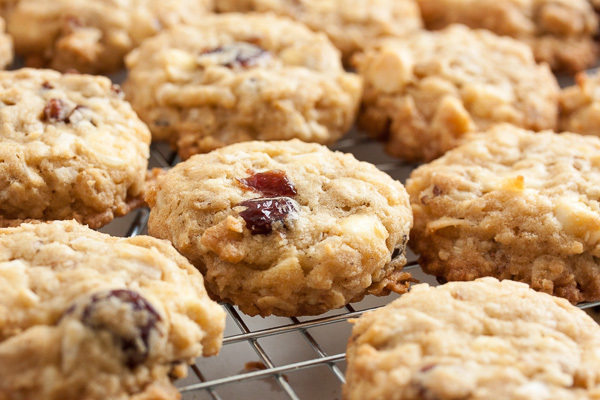 Adapted from "One-Bowl White Chocolate-Cranberry Drop Cookies" from Simply Sensational Cookies by Nancy Baggett. The recipe states it makes about thirty-five 2-1/2" cookies. I got fifty-two 2" cookies using a scoop slightly larger than a tablespoon. 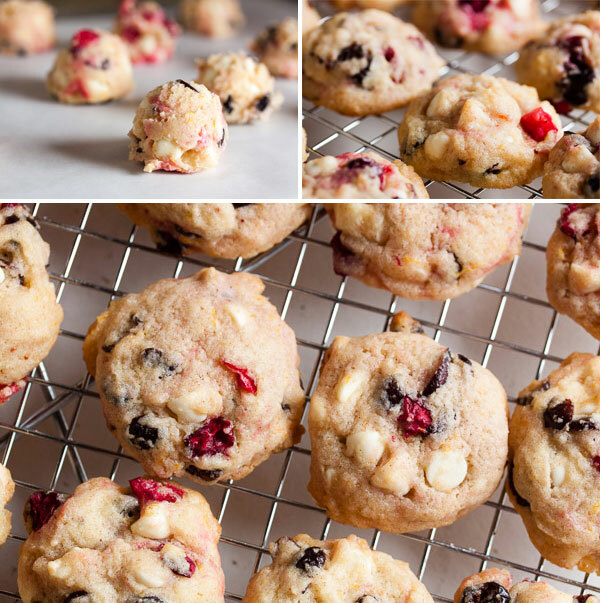 *Note: the cranberries are easiest chopped when they're still slightly frozen – they'll hold their shape better and won't just squish. I basically just quartered most of them, and halved the smallest ones. Add the egg, orange zest, vanilla, baking powder, cinnamon, ginger, and salt, and stir until well-blended. Add the flour and white chocolate chips and stir until just incorporated. Then gently add the chopped cranberries. The recipe stated that the dough might be crumbly at this point. If so, you can add a tiny bit of water to make it easier to work with. I found the dough was very soft already though. Bake for about 11-13 minutes, until lightly golden brown around the edges, rotating the baking sheet halfway through. Allow to cool on a wire rack for a few minutes before removing the cookies from the pan and allowing them to cool completely. Thanks dina! They’re definitely one of my new favourites.